Children are more motivated when rewarded for good behaviour, good work etc. A variety of good resources for rewarding pupils can be produced quickly and easily using symbol support. Smiley face stamps are used as rewards when each child reaches their target. 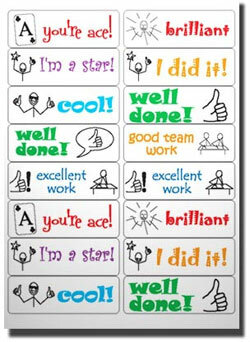 Symbolised stickers can be awarded for good work and positive behaviour.